This authoritative continuing education course identifies the advantages of strength training for fat loss and offers program design concepts to meet specific training and athletic goals. Applying Nick Tumminello’s science-based approach to metabolic strength training, Strength Training for Fat Loss CE Course offers basic, tried-and-true programs for new and experienced professionals alike. This course uses the text Strength Training for Fat Loss to offer 30 workouts and 150 exercises for clients who are constantly looking for innovative ways to lose fat and develop lean muscle. Content focuses on the three Cs of metabolic training, a unique approach to accelerating metabolism and maximizing fat loss while maintaining and building muscle. In addition, the course includes a one-hour webinar that explains the beneficial effects of strength exercise on body composition, metabolic rate, and resting blood pressure, providing additional insight into the creation of strength training programs for clients that positively affect body composition and assist with weight loss. Identify the health and performance benefits of fat loss through strength training. Describe the three main concepts of metabolic strength training and understand how to apply them in workout programs for all levels. 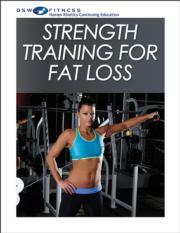 Learn metabolic strength training exercises using a variety of equipment as well as body weight. Understand nutrition concepts to accelerate metabolism for fat loss and how they complement strength training exercise programs. Design effective metabolic strength training programs to meet specific goals for fat loss. Learn correct positioning and technique for circuit, combination, and complex training routines with weight equipment and body weight. Learn proper warm-up and cool-down techniques to use as part of strength training for fat loss. Develop progressive, systematic strength training workout programs, which in combination with nutrition recommendations will result in fat loss for beginning and advanced exercisers. Understand the science and research related to why strength training should be a vital part of any weight-loss program. A continuing education course for personal trainers, strength and conditioning professionals, and health, wellness, and fitness coaches and consultants. As an educator, Tumminello has become known as the trainer of trainers. He has been named 2016 NSCA Personal Trainer of the Year by the National Strength and Conditioning Association. He has presented at international fitness conferences in Norway, Iceland, China, and Canada. He has been a featured presenter at conferences held by such organizations as the IDEA Health & Fitness Association, the National Strength and Conditioning Association, and DCAC Fitness Conventions, along with teaching staff trainings at fitness clubs throughout the United States. Tumminello holds workshops and mentorship programs in his hometown of Fort Lauderdale, Florida. He is the author of Building Muscle and Performance: A Program for Size, Strength & Speed (Human Kinetics, 2016) and Strength Training for Fat Loss (Human Kinetics, 2014), has produced more than 20 instructional DVDs, and is the coauthor of the National Strength and Conditioning Association’s Program Design Essentials and Foundations of Fitness Programming. Tumminello is also a continuing education course provider for the American Council on Exercise, the National Academy of Sports Medicine, and the National Strength and Conditioning Association. Tumminello has been a fitness professional since 1998 and co-owned a private training center in Baltimore, Maryland, from 2001 to 2011. He has worked with a variety of exercise enthusiasts of all ages and fitness levels, including physique and performance athletes from the amateur to the professional ranks. From 2002 to 2011, Tumminello was the strength and conditioning coach for the Ground Control MMA fight team and is a consultant and expert for clothing and equipment companies such as Sorinex, Dynamax, Hylete, and Reebok. Tumminello’s articles have appeared in more than 50 major health and fitness magazines, including Men’s Health, Men’s Fitness, Oxygen, Muscle Mag, Fitness Rx, Sweat Rx, Status, Train Hard Fight Easy, Fighters Only, and Fight! Tumminello is also a featured contributor to several popular fitness training websites. He has been featured in two New York Times best-selling exercise books, on the front page of Yahoo and YouTube, and in the ACE Personal Trainer Manual. In 2015 Tumminello was inducted into the Personal Trainer Hall of Fame.